The Saser, new type of acoustic laser device, has been produced by Scientists at The University of Nottingham, in collaboration with colleagues in the Ukraine. A Saser produces an intense beam of uniform sound waves on a nano scale. The Saser mimics this technology but using sound, to produce a sonic beam of ‘phonons’ which travels, not through an optical cavity like a laser, but through a tiny manmade structure called a ‘superlattice’. This is made out of around 50 super-thin sheets of two alternating semiconductor materials, Gallium Arsenide and Aluminium Arsenide, each layer just a few atoms thick. When stimulated by a power source (a light beam), the phonons multiply, bouncing back and forth between the layers of the lattice, until they escape out of the structure in the form of an ultra-high frequency phonon beam. The Saser is the first device to produce sound waves in the terahertz frequency range; its coherent acoustic waves have nanometer wavelengths. A Saser could be used to look for defects in nanometer-scale objects like microelectronic circuits. Science fiction fans may wonder about other uses, just as lasers can be used for purposes other than those found in industry. 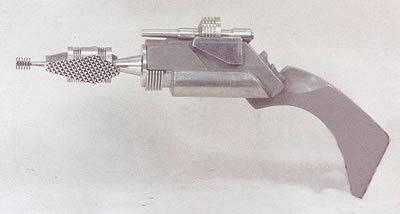 For example, in the original series version of Star Trek, Klingons carried "sonic disruptors". Take a look at this clip from the promo from the Star Trek episode Errand of Mercy; watch carefully to see sonic disruptors. Read a lot more detail about sasers and their potential uses in the The University of Nottingham press release; thanks to Winchell Chung for the tip and the reference for this story.